At the World Economic Forum on ASEAN in Hanoi last month, Thongloun Sisoulith, Prime Minister of Lao PDR acknowledged the recent devastation caused by a hydroelectric dam failure in his country and added that his government would proceed with caution with regards to future hydroelectric investments. Often touted as the “Battery of Southeast Asia,” Lao has 46 operating hydroelectric power plants and intends to almost double that number by 2020. It currently exports 67 percent of all its hydropower generated electricity, accounting for almost 30 percent of the country’s total exports. The destruction caused by the rupture of auxiliary dams in two southern provinces of the country, affected 13 villages and claimed the lives of hundreds. The incident cast doubts on not only the sustainability of Lao’s hydroelectric ambitions, but hydropower generation in the Southeast Asian region as a whole. As Southeast Asia continues to grow at a phenomenal rate, so too does its demand for energy. This demand must be met efficiently and at low costs. One such way of achieving this is to turn to hydropower which - if the country in question is geographically blessed - is a cheaper and relatively cleaner alternative to fossil fuels. According to the International Renewable Energy Agency (IRENA), hydropower capacity in the region grew almost threefold from 16 gigawatts (GW) to 44 GW between 2000 and 2016. 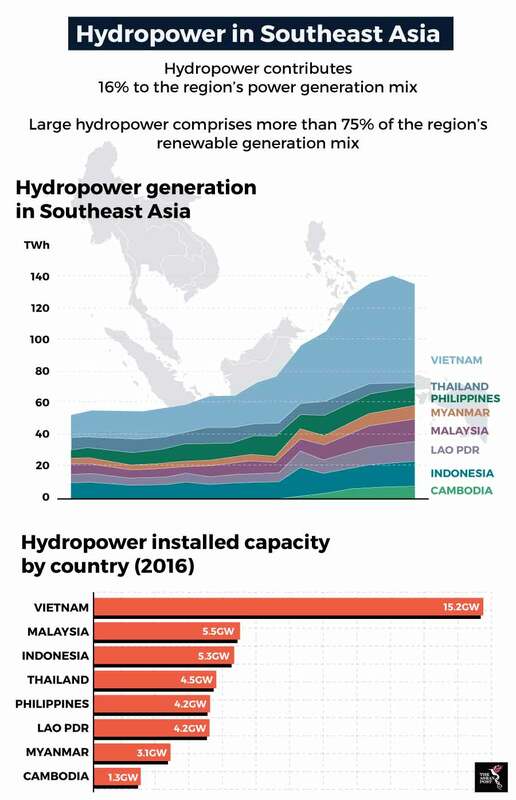 The major users of hydropower technology are Association of Southeast Asian Nations’ (ASEAN) member states in the Indochinese region and the Philippines. Numbers by the World Energy Council indicate that in terms of installed capacity, Vietnam leads the way in Southeast Asia with 15,211 megawatts (MW). A study by the United Nations (UN) and Singapore financial services provider, DBS, revealed that the market for investments in hydropower in the region is valued at US$90 billion. Much of this opportunity lies in large hydropower projects. Such projects are normally taken on by large independent power producers (IPPs) and can take upwards of 10 years to just plan and conduct the necessary assessments before actual financing starts. The most obvious danger that hydroelectric dams pose is its implications on the natural environment. One study by the intergovernmental Mekong River Commission, revealed that the long-term impact of hydropower projects in the Mekong basin could result in a steep decline in fish catch to the tune of US$1.57 billion. It is also forecasted that rice production costs could increase by as much as US$950 million. As a result, communities living downstream could face potential hardships resulting in rising levels of poverty. Food security there could also be negatively impacted. Dam construction often incurs additional social costs by way of its negative impact on local communities. In Malaysia for example, the development of the Bakun Dam has been met with protests from the local indigenous communities there. The construction of the dam had displaced more than 9,000 people who have been living there for many generations and resulted in the indigenous people living in the area becoming vulnerable to waterborne diseases such as malaria. According to the Union of Concerned Scientists, the risks associated with hydroelectric dams also affect wildlife, especially downstream from the facility. Reservoir water which is usually more stagnant than river water could result in higher amounts of sediments and nutrients which in turn cultivate an excess of aquatic weeds and algae. These weeds could then crowd out river animal and plant life. Additionally, if too much water is stored behind the reservoir, the segment of river downstream from the reservoir could dry out, affecting plants, animals and people dependent on the river for sustenance. As such, this water must be released appropriately in order to maintain adequate water levels downstream. Nevertheless, reservoir water is typically low in dissolved oxygen and colder than regular river water and when released, could negatively impact downstream plants and animals. Though the primary intention for using hydropower as a less carbon-emissive source of energy is profoundly noble, its impact on the environment should not be understated. Implementing hydropower projects may make our energy needs more sustainable but dismissing local concerns and environmental dangers would be akin to taking one step forward but two steps back.